Backpacks have become the most popular means for school age children to carry their books and school supplies. And in fact, when used correctly, a properly designed backpack is an excellent way to carry the necessities of the school day. Unfortunately, thousands of children each year experience back pain related to use of school backpacks that are too heavy or used incorrectly. It appears that public awareness of backpack related back injuries has helped to reduce its incidence. With the start of the new school year, however, it is worth offering a reminder to parents and children of ways to prevent these from occurring. Choose the right backpack - Be sure that the backpack is the appropriate size for the child. A well-designed backpack will include wide, padded straps to reduce strain on the shoulders and spine. A chest (sternum) strap and waist belt will help distribute the load over the entire trunk. Some of the best ergonomically designed backpacks are made by companies that specialize in equipment for hiking (Jan Sport, Osprey, North Face, etc.). Additionally, salespersons in outdoor specialty shops can be helpful in making sure that the backpack fits appropriately. Straps that compress the contents of the backpack will stabilize the load and keep it closer to the back. If carrying heavy loads is unavoidable, a convertible backpack with wheels may be a consideration. Reflective material to enhance visibility is an important safety feature for children who walk at dusk or after dark. Wear the backpack properly - A proper fitting backpack rests evenly in the middle of the back, rather than hanging below the level of the lower back or waist. Both shoulder straps should be used rather than just one. Shifting the weight of the backpack to one side by using only one strap alters back symmetry, which can lead to neck and back strain. This advice also applies to backpacks that are designed with only one strap that crosses the front of the body. When walking a significant distant, encourage your children to use the chest and sternum strap. Avoid overloading - Most experts recommend that children carry no more than 15% of their body weight in their packs. For a 50 pound child, this would mean that the backpack and its contents should not weigh more than 7.5 pounds. This amount would double to 15 pounds for a 100 pound child. One way of gauging this is to weigh the child with and without the backpack on the bathroom scales. More weight than this can cause compression of the discs that serve as cushions between the bones of the spine and cause excessive curvature of the spine. 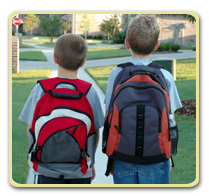 Studies have shown that the amount of back pain reported by children increases along with the load in the backpack. Parents can help to reduce the weight in their child's backpack by seeing that only those items needed for the school day are packed. Unnecessary books or items (cell phones, music devices, video games, etc.) should be left at home. Consider alternatives - Whenever possible, children should use lockers or their desks during the school day to minimize the load carried in the backpack during the school day. If there is an option, purchase paperback, rather than hard-bound books in order to decrease the weight of the books that are being carried. Only those textbooks that are needed for completing homework should be brought home in the backpack. If unavoidable due to the number or weight of required textbooks, a second set could be purchased for use at home. Back pain that is present when wearing a backpack but goes away when removed. Struggling due to excessive weight when putting on or removing the backpack. Following the recommendations for proper use of the backpack will, in many cases, take care of the problem. Back pain in children deserves medical attention if it persists despite these measures, inhibits normal activities, requires regular medication, or affects sleep habits.